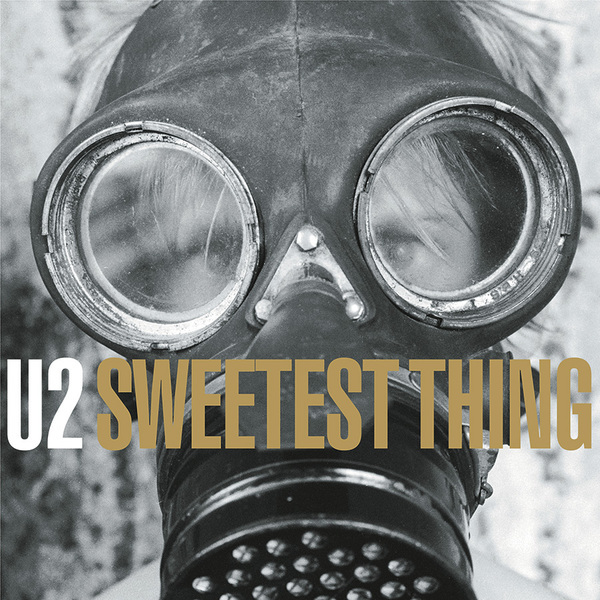 A new version of The Sweetest Thing was released as a single to promote the release of U2's first compilation, 'Best of 1980-1990/The B-Sides'. Producer Steve Lillywhite was involved in 'finishing the track.' New vocals and additional instrumentation were added to the re-worked version. The song was originally recorded in September 1988 and released as a b-side to Where The Streets Have No Name. Sweetest Thing was written by Bono to make up to his wife Ali for having to be in the studio recording on her birthday: Ali agreed to be featured in the video for the remake.... if the proceeds from the single went to The Chernobyl Children's Project. Both the release of the single and the subsequent 2-CD compilation featured Peter Rowan in the artwork for the sleeve. Rowan had graced the covers of several earlier U2 releases including their first single U2-3 and the albums Boy and War. Both the old and new versions of Sweetest Thing appear on the compilation, Best of 1980-1990/The B-Sides. The song was voted the No. 1 Irish Single in Hot Press Reader's Poll. It was also selected as the Best Irish Single at the Heineken/Hot Press Awards ceremony. A cover by Harlem choir New Voices of Freedom appeared on the Scrooged soundtrack. This was the same choir U2 visited at their church during the Joshua Tree tour. The choir even joined U2 onstage at Madison Square Garden for a rendition of I Still Haven't Found What I'm Looking For. Irish band Boyzone also covered the song but their version remains unreleased - they also made a cameo appearance in U2's video for Sweetest Thing. U2 performed the song live for the first time when they received the Freedom of the City award in February 2000 in Dublin. The single peaked at the following positions: No. 3 on the UK singles chart, No. 63 on the Billboard Hot 100 Singles chart, No. 9 on the Billboard Modern Rock chart, and No.1 on the Canadian singles chart. The book, Inspirations, is a compilation of handwritten lyrics donated by various artists for the Hits Under The Hammer auction. U2 contributed two songs - Please and Sweetest Thing. A portion of the profits from the sale of Inspirations went to benefit the Nordoff-Robbins and Norwood Ravenswood charities for disadvantaged children and adults.